totally great. its fun to use. 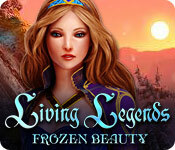 This is a great hidden object game for beginners. In many instances there are more than one object that will meet the criteria, and you have several customers at a time so if you can't find an object you can move on to something else. Customers leave if you take too long and are replaced with new customers. 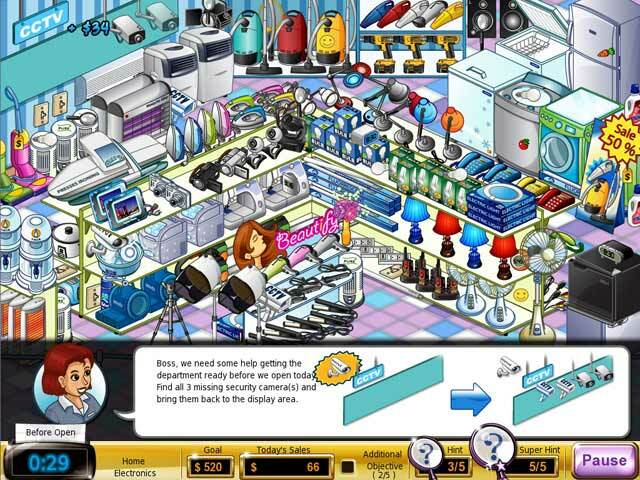 Lots of fun in this combination hidden object/time management shopping-themed game. I played this one and the second in the series. Both are fun. Hope there are more coming. 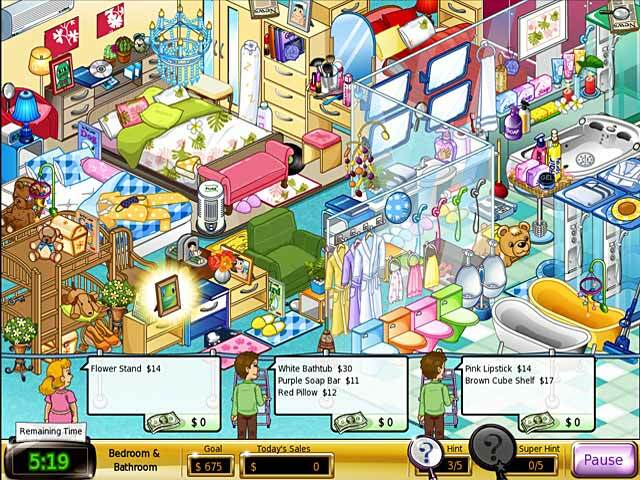 It is a good game to pass the time i found it to be a time management game with a bit of hidden object thrown in. It does get a bit repetitive though after awhile. The graphics are ok and the sound is ok. Simple but fun at the same time! This looks like a simple little game, but when you get into it you discover that there are a LOT of objects to sort through, to find what you need. But with practice, it gets easier, and you will enjoy yourself. If you take too long finding what the customers need, they will vanish and cost you a few points. That is no big deal to me, but others may find themselves rushed sometimes. I did enjoy playing it, and also thought the mini games were fun! You can earn extra hints with different things, and that really helps! Give it a try, and I don't think you will be disappointed. I think this game is just SO adorable! I absolutely love playing it for the graphics alone. The whole 'personal shopper' thing is something I really enjoyed throughout and it never lost it's fun! There is also a lot of smaller challenges and mini-games to keep you interested and to stop it being repetitive. The one thing I would change about this game, which I was hoping would be implemented into the second one but wasn't is the ability to click and the item be delivered instead of having to drag it to the person that requested it! This game is really fun! 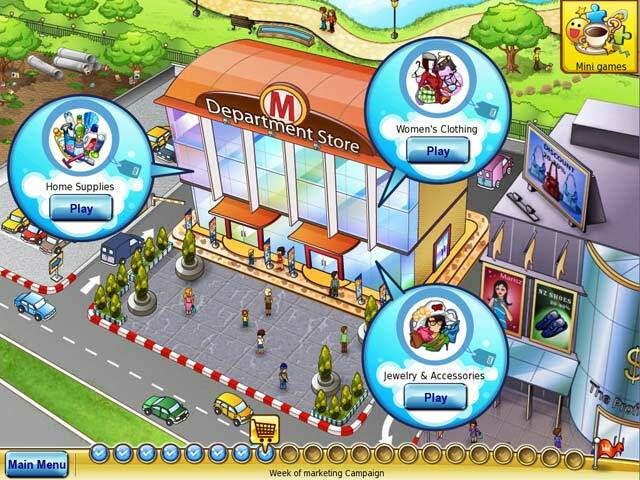 I love that it's just a fun and simple hidden object game with cute graphics and fun mini games. Playing through all the different departments was great! 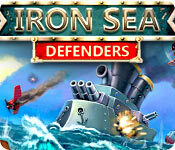 For those looking to simply play a hidden object game then you might enjoy this one. You get to run a store with customers, find stuff for people, you get hints. It's just super fun! I'm so glad I didn't play this first. Good Parts: The storyline. Liked the tutorial OK Pars: Voice-overs would've been nice Bad Parts: Graphics are awful, So glad they were fixed up by the third game. The game is too hard. The objects are all junkpiles and were not very clear. Used all my hints on the first level. Limited hints. Needed unlimited cause the game was so stupid. The game is a complete and utter bore. Completely and utterly dreadful. No other way to describe it! Stay away from this game!